First Friday of every month! 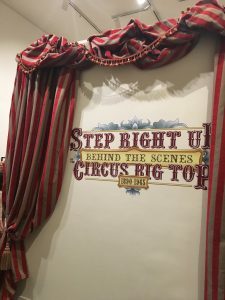 “Step Right Up!” takes viewers behind the scenes of the circus, exploring the dramatic pageantry, colorful past, and living presence of this grand American theatrical tradition. This stunning exhibit features posters, costume regalia, historic photographs, billboards, graphics and oral histories from past performers. Exhibit on display November 12-January 9, 2018. 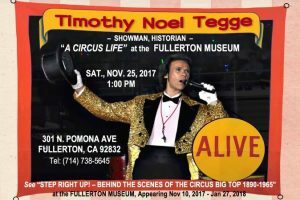 Join us for this incredible lecture with Timothy Tegge, collector and performer. April 5th Downtown Fullerton Art Walk! New Art Exhibition by Emily Heller at Lolo Boutique, Friday, March 1, 2019 beginning at 6 pm. The Downtown Fullerton Art Walk is a coalition of galleries and businesses whose goal is to promote the arts and build community. ©2018 Downtown Fullerton First Fridays Artwalk Association. Domain provided by Graves. | Hosting and Site Development by primate.